Missed Part 1? Click here to visit it! Food aisles in your favorite pet store can be colorful and bewildering places, especially for new pet parents. So how is a pet parent to decide which dog or cat food to buy? At Taste of the Wild, we believe pet parents have a right to know what they’re feeding their canine and feline companions. The pet food label contains valuable information, if you know how to read it. Since a majority of pet owners commonly look at the product name, guaranteed analysis and ingredients list, we’ll decode pet food names, explain what the “guaranteed analysis” means (as well as what it doesn’t mean), and translate some confusing chemical names found in the ingredients list into their common nutrient names. The product name — Canyon River Feline Formula with Trout and Smoked Salmon, for example — is one of the first things buyers notice on a pet food label. It’s often what causes them to stop, look more closely at the product, and decide to buy or not to buy. Because pet parents often search for food that contains specific ingredients, many pet food names highlight those key ingredients. But what many cat and dog owners don’t realize is that the product name says a lot about the presence of the named ingredient in the product. In the United States, a pet food’s name is subject to strict rules created by the Association of American Feed Control Officials (AAFCO) and adopted by state governments. The 95% rule ­— Pet foods meeting the 95% rule have very few ingredients and simple names, such as “Kitty’s Favorite Tuna Food.” At least 95 percent of the food must be the named ingredient, not counting the water added for processing and added vitamins and minerals. When added water is considered, the named ingredient must still make up 70 percent of the product. 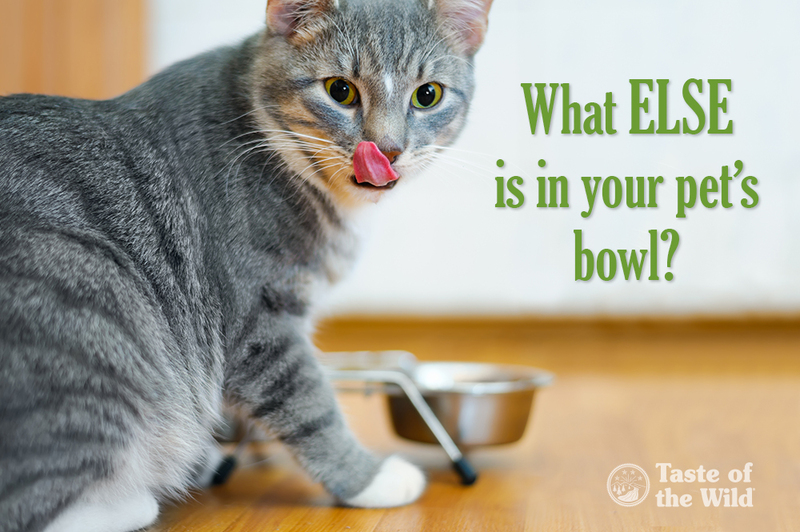 The 25% or “dinner” rule — If a pet food names an ingredient that accounts for at least 25 percent of the total product weight (not counting water for added processing) but less than 95 percent, the name must include a qualifying term such as dinner, platter, entrée or formula. The 3% or “with” rule — Add the word with to the product name and the food is only required to include 3 percent of the named ingredient. The flavor rule — The pet food must contain enough of the named ingredient for the ingredient to be detected, but a specific percentage is not required. Pet parents also frequently look first at the guaranteed analysis section of a pet food label for information about that product. This is the section where you’ll find the minimum percentages for crude protein and crude fat and the maximum percentages for moisture and crude fiber. These are the four nutrients that pet food makers must list in the guarantee. Many manufacturers will also list other guarantees within this section. Crude refers to the specific method of testing used to estimate the amount of the nutrient present in the food, but the term does not refer to the quality of protein, fat and fiber. Only minimum and maximum amounts are provided; these percentages do not reflect the exact amounts of protein, fat, fiber and water in the product. The values are provided on an “as is” basis, meaning that the amount is based on the food as it is fed to your dog or cat including the water present in the food. You can use the guaranteed analysis panel for a rough estimate of protein, fat and fiber in a specific food. But these numbers are only a starting point when comparing different products or brands. To more accurately compare products, these percentages must be converted to a dry matter basis (the amount of food without any water), since different foods contain varying amounts of water. What’s in this pet food?! By law, pet foods sold in the United States must list each ingredient, including additives, in the ingredients statement of the label. Ingredients are listed in descending order by weight, which doesn’t tell you the amount or quality of the ingredient. However, you can use the ingredients list to determine whether the primary ingredients are from plant or animal sources, or if the food contains an ingredient to which your pet is allergic or intolerant. Another helpful fact about the ingredients list: AAFCO has established names and definitions for many ingredients used in cat and dog foods. If there isn’t an AAFCO name for a particular ingredient, then the common name (for example, peas, potatoes, cranberries) is used. And what about the unfamiliar chemical-sounding names, like pyridoxine hydrochloride, ascorbic acid and ferrous sulfate? Those ingredients are typically vitamins and minerals — vitamin B6, vitamin C and iron, respectively — that must either be approved by the Food and Drug Administration or be generally recognized as safe to be included in pet food. Veterinary nutritionists caution pet parents to not spend a lot of time trying to decipher the ingredients list for good reason. Both nutrients and high-quality ingredients are important to meeting your pet’s nutritional needs. A pet food is the sum of its thoughtfully blended parts, with the quality of the food overall being more important than the presence of any one particular ingredient.